While the Accidental Locavore has a fascination with Pinterest, most of the food posted on it doesn’t appeal to me. Once in a while, something will look really good and get re-pinned to my “Things to Try” board. And once in a longer while, I will actually make one of these “Things to Try” (now, maybe I should create a “Tried” board…). 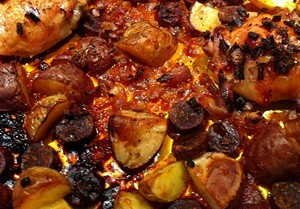 Such was the case with the Spanish Chicken with Chorizo and Potatoes. So I gave it a shot the other night. It’s super easy, prep time is about 10 minutes and it feeds 2 with leftovers (see verdict below). 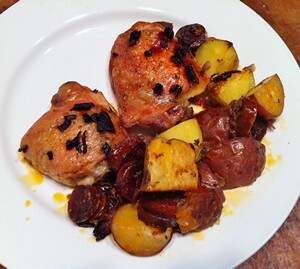 The Accidental Locavore makes an easy chicken recipe with potatoes and chorizo. A fast main course chicken dinner with a Spanish twist. Preheat the oven to 425°. Put the oil in the bottom of a shallow roasting pan (I used a hotel pan--rimmed cookie sheet). Rub the skin of the chicken in the oil, then turn skin-side up, salt and pepper the skin side. 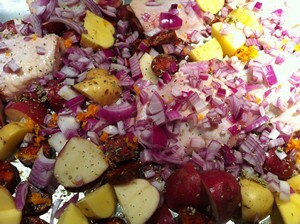 Add the chorizo and potatoes, tossing to coat with the oil. Sprinkle the onion and the oregano on top, then zest the orange over everything. Cook for 1 hour, basting every 20 minutes. Serve and enjoy! The verdict: The original recipe was just a mess! What you have here is my best adaptation and the comments are based on how I interpreted the recipe. Good, but needs more seasoning. I’m not sure if it was just that the chorizo on hand might have been a little dry, but after cooking, it was pretty crispy. Solution for that would be to use bigger pieces or add them halfway through the cooking. We thought a mix of Mexican (fresh) and Spanish (cured) chorizo would be interesting. I cut the onion into a pretty fine dice and it was essentially incinerated by the time the chicken was cooked. Bigger chunks should take care of that. Some Spanish (green) olives would add some color and saltiness to the dish and I’ll probably toss them in next time. Because this was such a simple dish to toss together, I’ll definitely make it again. Frank said they were the best roasted potatoes I’ve made (high praise indeed!) and used the leftovers to make home-fries the next morning.